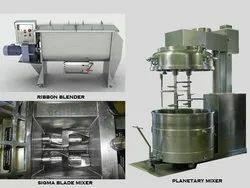 The material used for Ribbon Blender construction is stainless steel of 180-240 grit interior finish. 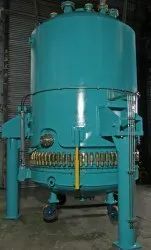 The Ribbon Blenders are generally an open tub with welded or bolted end caps on each. 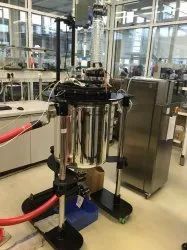 These are mild duty blenders primarily used to mix pre-processed powder components like dried granules, pre-sieved powders and others. Our products are mainly used for solid-solid mixing or solid-liquid mixing where high shearing force is not required. CE and ATEX Certified, GMP and cGMP CompliantAgitated Nutsch Filter Dryer Validation Documents like OP, IQ, PQ & DQ provided. We are one of the largest Manufacturer and Exporter of Agitated Nutsch Filter Dryer .It is available in various capacity ranges from 50 Liters to 10,000 Liters. All Stainless Steel/ Hastelloy construction with Contacts / vapor parts in 304/ 316 / 316L built to custom requirement. All Process contact surfaces finished with corrosion-resistant fluro-polymer coatings such as Teflon, Halar, etc. Model : CGMP construction with pre insulation of Jacket with mirror finish for API Producing & Standard Construction for Non Pharma processes. Applications: Chemical, Pharmaceuticals, Food Products Dyes & Intermediates, in GMP & Non GMP models. CE and ATEX Certified, GMP and cGMP Compliant Tray Dryer. Validation Documents like OP, IQ, PQ & DQ provided. Our Well Engineered Tray Dryers are supplied worldwide with all document required for GMP, USFDA approval. 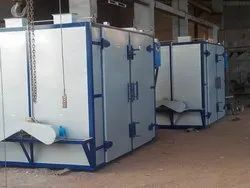 Capacity of tray dryer-It is available in various Capacity from 6 Tray to 196 Trays.